Multiple generations come together in this cool, sleek Town and Country home. Sleek white furniture contrasts with stainless accent tables. Three spherical fixtures illuminate the space. With plenty of space and storage, the kitchen is functional for the multi-generational family. Eggplant walls create depth in teh dining room. A custom-built dining table that seats twelve was designed to add a bit of drama to the space. The his-and-her study is modern yet professional. A custom upholstered bed frame by Centorbi is the focal point of the space. Unique in shape, the bathroom is reminiscent of an ancient greek spa. “The purpose of building our home was to create a family-friendly space while allowing everyone to have privacy,” says the homeowner. Lighting fixtures and paint colors were among the first choices made in each room. No paint color is repeated anywhere throughout the home. Each color was carefully selected for the room it is in. 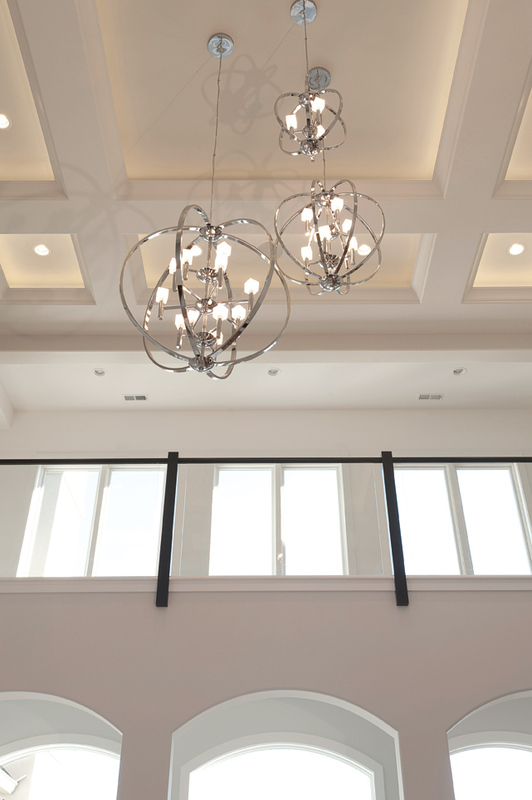 In terms of lighting, Krista and the homeowner traveled to Dallas and selected all of the fixtures in one day. “We weren’t always sure where each fixture was going to go, but we chose what we liked and found a place for it,” Krista says. A set of three spherical stainless steel fixtures fills the vast ceiling in the home's great room. Open and pristine, the room conveys the stark simplicity felt throughout the home. Floor-to-ceiling windows and second-story glass panel half walls allow natural light to spill in to the space. 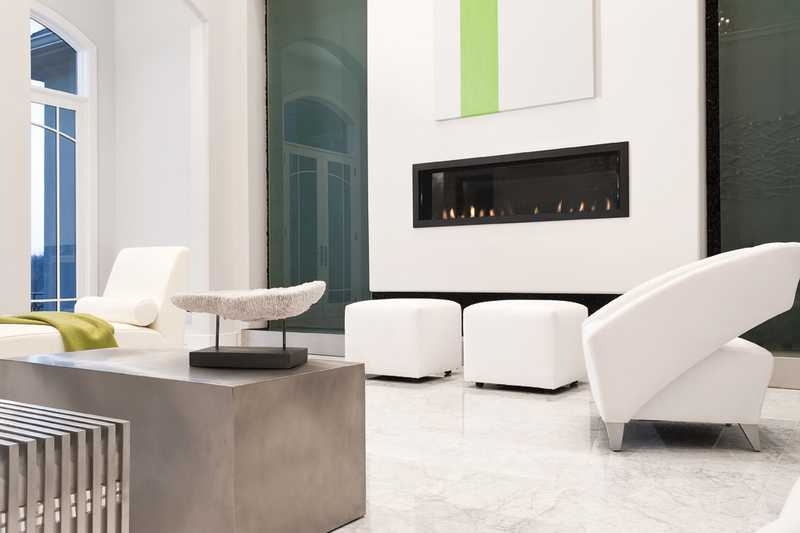 Sleek white furniture contrasts with stainless accent tables creating a swank place to entertain guests. Although lacking in color, varying textures from the leather and fabric on the furniture, metal of the tables and glass in the walkway panels generate interest without over ornamentation. Opposite the seating area, a wall-length black river rock waterfall borders a rectangular fireplace resulting in a unique fire and water combination. Not only is the wall the showpiece of the room, it is also beneficial to the home. The water wall humidifies the home and cleans the air by pulling the dust out. As dust and dirt are sucked into the water, the water filters through a purification system and redistributes back down the wall. Functional and bold, the wall makes a statement in the otherwise sleek room. Rich eggplant walls greet you as you enter the dining room. 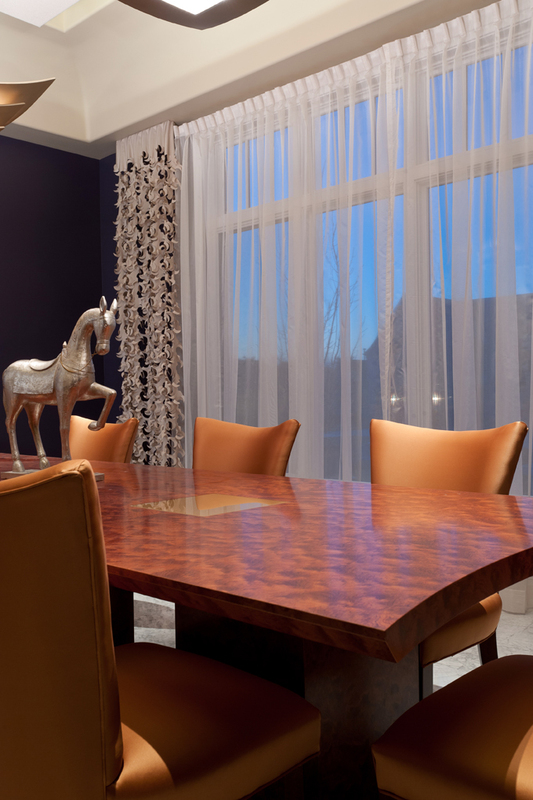 Selected for its versatility, the color adds depth to the space and pairs well with satin copper dining chairs placed around the custom-built 12-foot dining table, with glass inserts, built by Centorbi Custom Cabinetry. 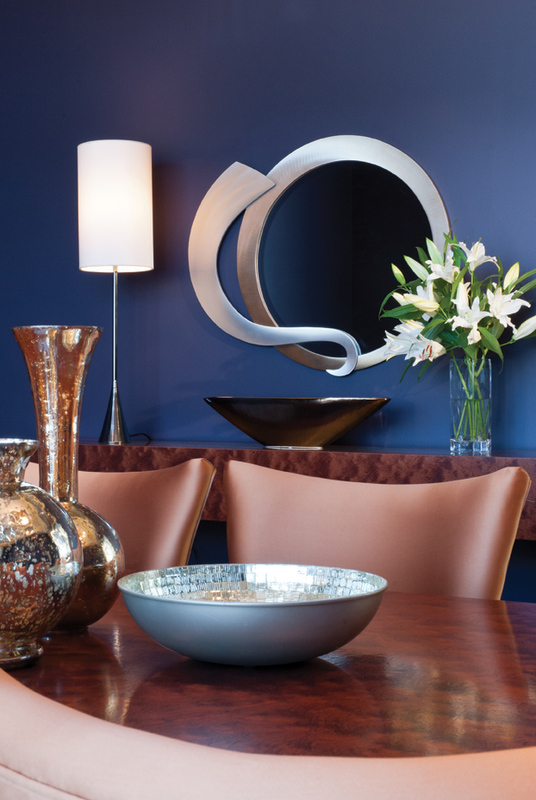 “The copper adds a pop of color, but it is different than what you would expect,” says the homeowner. Draped in an exotic wood veneer, Kewazinga, the dining table slightly curves at the ends to follow the curve of the light fixtures above. The uplight of the fixtures provide a warm glow to the room. A luminous microbead wall treatment was applied to ceiling to catch the light from the fixtures. A matching serving piece, also by Centorbi, placed behind the dining table allows for easy access when entertaining guests. Laser cut sheers let in natural light from the front of the home. With plenty of family space in the home, there are also many private areas for each family member. A study for both homeowners continues the modern look throughout the home while maintaining a professional atmosphere. 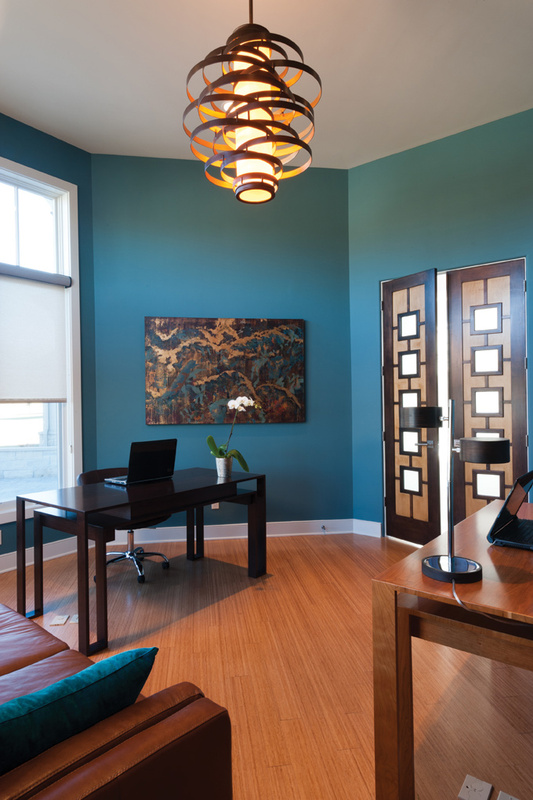 Mediterranean blue walls give the study a darker, but not traditional, feel. Bamboo flooring softens the room and is a nice contrast against the darker wall color. Centorbi created his-and-her desks in a light and dark wood tone to pull in the wood colors of the two-tone double doors by TruStile. Bookcases built into a rounded inlet display personal relics collected by the homeowners. “The shelves were important for us to have a place to put our personal things so they are not in your face when you come into our study,” says the homeowner. Just across the hallway from the master bedroom, the homeowners can easily slip in and out of the study late at night or early in the morning. Tranquil and cool with clean lines, the master bedroom is the perfect escape for the hardworking homeowners. An oversized mahogany and silver upholstered bed frame by Centorbi makes a bold statement in the otherwise serene room. Off-white nightstands and bench enhance the minky gray walls, which give off light hints of purple. Adjacent to the master bedroom is a seating area with a built-in barista and private balcony that is partitioned off with pocket doors. “The couple wanted a separate area that could allow one to watch TV or read while the other was sleeping without disturbing them,” Krista notes. 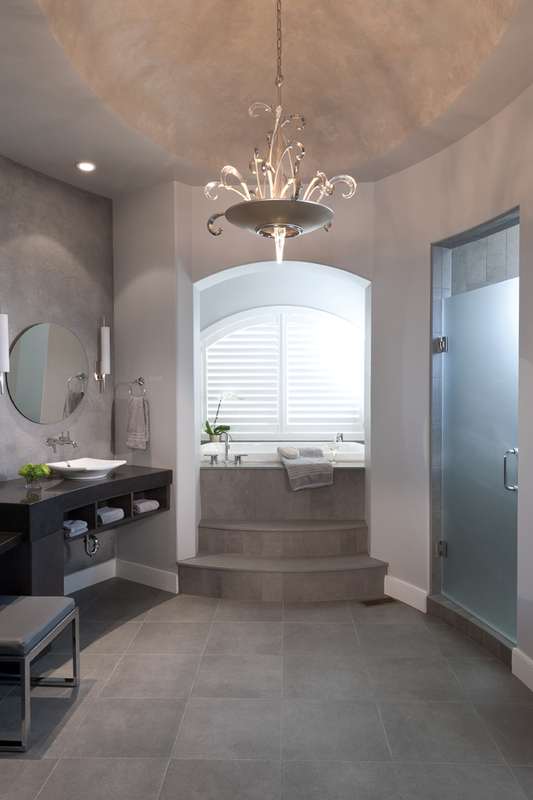 The gray theme of the master carries into the master bath, which the homeowner designed to resemble an ancient Greek spa. A plaster textured faux finish on the walls gives the appearance of stone. 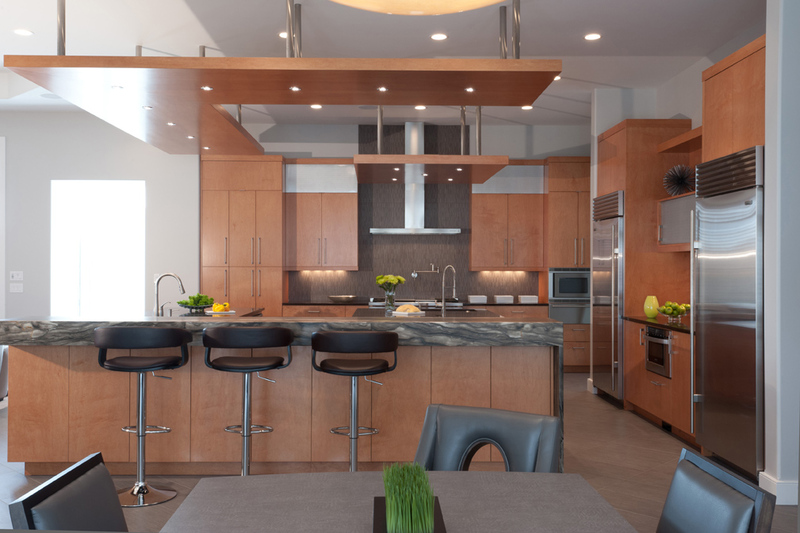 Minimal cabinetry, in maple with a mink-gray finish, reduces clutter keeping the space clean and sleek. One challenge the team faced when designing the bathroom was how to place doors on the shower and toilet area since the walls are rounded. The creative solution was to install matching frosted glass shower doors. “The glass doors let light from the main room into the shower and toilet area while also providing ventilation for the shower,” Krista says. The bathroom walls weren’t the only challenge in designing the home. The homeowners wanted their daughter’s room to be modern, not a typical request for a child’s room, which are usually themed. With a color scheme of pink, purple, white and yellow, Krista set out to create a space that the child could grow into. Bright, charming and fun, the homeowners’ daughter will be hosting tea parties, reading books and chatting on the phone in the space for years to come. Additional spaces in the home include in-law suites for both homeowners’ parents, a lower level kitchen with a sushi-bar feel, a guest suite, children’s’ playrooms and a pool room, featured on page 52 of this issue. To many, creating a home for multiple generations would be a daunting task, but by ensuring each member had their own personal spaces everyone in the family is content and together.